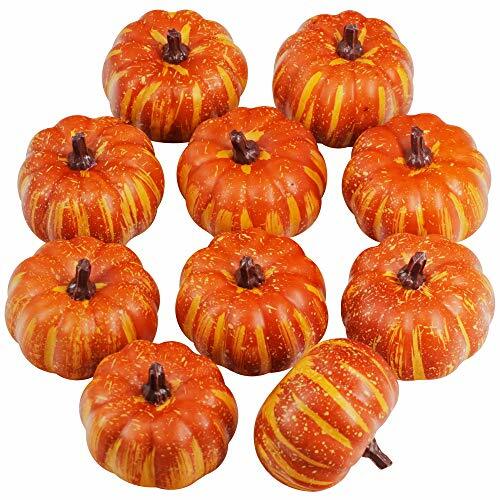 10 Pcs Artificial Pumpkins Fall Pumpkins in total. Made of foam. Decorative use. Artificial Pumpkins painted in a mixture of colors from orange and red to yellow.with realistic stripes and speckles. Each Foam Small Pumpkins is 2.6" Tall,3" in diameter. These cute Artificial Pumpkins combine with candles and maple,acron,pine cone,sunflower to create festive centerpieces.They can be used in dishes, bowls, and vases,and use them as table scatters.Perfect for autumn home decor and to decorate tabletops,table Fireplace. Pefect for your special Thanksgiving, Fall wedding, autumn parties and special events. These fake pumpkins also can used with creepy spiders, sinister skeletons, and other eerie ornaments to craft a scary Halloween scene. Quantity: 10 Pcs Artificial Pumpkins Fall Pumpkins in total. Material & Color: Made of foam. Decorative use. Artificial Pumpkins painted in a mixture of colors from orange and red to yellow.with realistic stripes and speckles. Size: Each Foam Small Pumpkins is 2.6" Tall,3" in diameter.